You're currently on our features and projects pages, with material ranging from the satirical to the theological. For more features, click here. 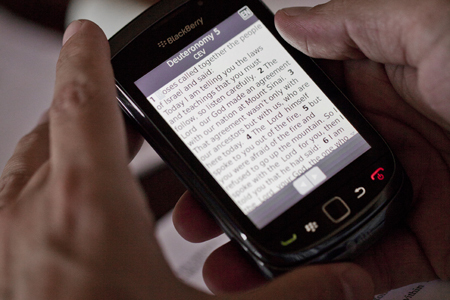 Mark Howe, who works on YouVersion, the Bible app bristling with over 100 Bible versions in multiple languages for cellphone readers, explains how getting the Bible onto digital devices such as smartphones and tablets has become a publishing phenomenon. Note to self: when publishing Bibles online, do not remove all references to God. I added this aphorism to my mental checklist after inadvertently deleting YHWH from a Bible in Arabic. Over 6,000 times. One of the great things about IT is that you can replicate your mistakes so much faster than by any other means. I told myself that orthodox Jews would not write that word anyway, but it didn't really help. I achieved this feat soon after starting work for YouVersion by contributing to a series of apparently innocuous decisions that, together, added up to the perfect typesetting storm. The source file used special markup for YHWH to allow it to be displayed in a different font, or small caps, or something. I ran the source through our validation software, but it didn't check that specific aspect of the document. I then converted the source to work on YouVersion, using another piece of software that did care about that specific aspect of the document but was too shy to mention it. And my Arabic is not up to proofreading Bibles (or ordering coffee, for that matter). Welcome to the world of digital Bible texts. I don't know anyone else who has made this particular mistake, but everyone working to put the Bible onto digital devices is faced with the same class of problem, which is created by the very nature of the task. The Bible is a large, complicated text. A complete Protestant Bible in English contains about three quarters of a million words and takes three days to read out loud. The typesetting is often quite complex, because of the wide range of literature types found in scripture and the need for several types of note. The book-chapter-verse reference scheme must be one of the world's earliest examples of metadata (text that describes another text), but it was not designed with the digital world in mind and is often a poor fit for modern versions that restructure sentences. The mere mention of Greek Esther (a deuterocanonical book that has chapter B in the middle of chapter 3) is enough to make the lower lip of hardened Bible typesetters quiver. So it's hard to do the right thing with Bible texts. But it's the Bible! Regardless of views on inspiration and inerrancy, anyone reading the Bible for any reason wants to read what the translators intended them to read. Getting it 90 or even 99 per cent right isn't good enough. That's why the proofreading of printed Bibles often takes years. But dead tree timescales do not work in the digital age. Some net-led trends come and go within that traditional proofreading timescale. Which leaves organisations trying to make scripture available within the digital world trying to complete a huge task without error in almost no time. Organisations like YouVersion try to do it anyway, and often do quite well, but there's always the spectre of, say, omitting all proper nouns from a Chinese Bible (another early error of mine which, in its favour, did make genealogies much more compact). The obvious solution would be for all Bible translators to get their texts into the same format, but that sort of consensus never happens in IT, or in the church for that matter. Except that this is precisely what is happening right now, under the banner of Every Tribe Every Nation (ETEN), an initiative which aims to get several thousand Bible versions into a digital format in the next 25 years. YouVersion expects to process its 100th ETEN-sourced Bible version before the end of 2012, with the prospect of hundreds more over the next couple of years. It's exciting to put online major versions in world languages that will be used by millions of people. But I have to say that, personally, I get more excited about some of the minority languages that, without a project like ETEN, might never appear in digital format. A good example is Da Jesus Book, in Hawaii Pidgin. For English speakers, it's a rare insight into what missionary Bible translation is all about. Dat "God's Talk" Guy, he wen come one guy jalike us guys. He wen stay wit us. We wen see how awesome he stay. He awesome, cuz he da one an ony Boy dat come from da Fadda. He like do plenny good stuff fo us, cuz dass how he stay. Everyting he say bout God, stay fo real. Every Tribe Every Nation is work in progress. Negotiating with hundreds of independent publishers takes time. Taking documents that previously may only have had to work with a single typesetting machine and converting them to work anywhere is painstaking. On the distribution end, we are also discovering how patchy support for minority languages can be on digital platforms. And, in one sense, I feel quite upbeat about that last observation. So often, it feels as if Christians in recent times have been playing catch-up with technology, in contrast to the way previous generations were pioneers in everything from printing and architecture to education and healthcare. For all the issues that are still to be solved, ETEN is trying to do things that the world's biggest tech companies haven't cracked yet, such as rendering minority languages correctly on mobile devices. There's a unity among Bible translators and publishers that stands in stark contrast to the fractured, fratricidal smartphone industry. In absolute terms, the Bible has already become a publishing phenomenon in new media, just as sales of dead tree Bibles continue to eclipse sales of every other book in the world. YouVersion apps alone have been downloaded over 35 million times, and are often among the most popular apps in any category in app stores. So here's to a vision of the church engaging in and transforming cutting-edge technology. And to Arabic Bibles that do mention God.